It’s every parents’ nightmare. We wake up screaming, “Oh No, I forgot to plan my child’s birthday party and it’s tomorrow! !” You really need birthday party ideas if you did. If so, I have one suggestion: Costco’s cake and pizza at your house. Hopefully, you have some time to plan and prepare for the big day. I want to help you make it as easy as possible. Let’s first look at the areas where you will need to do your planning. The key here is to balance your child’s interests with attention span. Nothing is more frustrating than buying everything for the party with one cartoon character and the day before the party, your child decides they like a different character. So choose a more generic theme like Construction instead of Bob the Builder. Your theme and budget will drive your plans for food, activities, and decorations. Younger children still need their naps, so you will want to find a good time when they won’t be getting cranky. If the children are all in pre-school together, you may want to have a morning party from 10-12 or 11-1 since they’re used to being active then. If you’re on a budget, you can also time the party so you only need to serve cake or nibbles instead of a meal. Two hours is the ideal length for all young children. If you go much longer, they get worn out or overstimulated. And that will lead to meltdowns. You can control a lot about the party in your own home. But I completely understand if you don’t want that kind of energy in your home. If the weather is nice, you could rent a spot at a nearby park or beach if one is nearby. All you really need are picnic tables for a central base, and the kids can have fun exploring. Just make sure they know to stay within eye-contact. There are also many paid options with kid-friendly restaurants, gymnastics centers, kid-targeted museums, etc.Close to me are ceramic painting shops. You could have a party where the kids meet there and paint a special plate or mug for themselves. Other kids birthday party ideas are self-contained places where the kids are checked in and are not able to leave unless they’re with the person who checked them in. These party places have games, climbing structures, and other fun activities as well as food and drinks. If you want an off-site party, find a place that your child likes, and ask the manager if they have birthday party ideas for children. You can go as big or as small as you like. It’s up to you, your child, your budget, and your imaginations. For a pirate theme, you can spray paint rocks with gold paint. If you spray one for each child, you can then paint their name on the rock. Then that could be their goody for attending the party, and you won’t have to put together bags of toys and candy that get lost or tossed. For a Luau, you can give each child a flower lei and buy plastic tiki mugs that they can use at the party and then take home. Once your child’s age is over three or four, you should let them have input on the guest list. One quick tip is if your child’s birthday is during the summer months or holiday breaks, make sure you get the names and phone numbers early on so you can be sure that they are invited. For off-hour parties, serve only the cake, ice cream, and a beverage. You could provide nibbles like pretzels, fresh fruits, and vegetables if you’re concerned about a sugar rush. For older children, you may wish to let them get involved in the making of the food like a personalized mini-pizza or build your own sandwich. Most younger children are more interested in how the cake looks rather than how it tastes. So you could buy a smaller cake from a local bakery and have it personalized and specially decorated. Middle-aged children often don’t care as long as it tastes great and everyone likes the flavor. And older children will have fun being involved in the choosing and decorating of their cakes. If you have a specific theme, you should put that on the invitation and encourage the children to dress accordingly. Otherwise, let the parents know that their child should be dressed comfortably. If you have a local teenager who babysits, you can hire them to help out with the party. They can keep an eye out for the children who are not engaging or seem upset. They can also rally the troops for the next fun activity! (And give you a moment to run to the bathroom or get a sip of water)Have the activities planned out in advance, but be flexible in when you do them. Crafts are a great activity for birthday parties. It gives children a chance to sit down and have some quiet time while they focus on making something. Some kids won’t want to do the main craft for whatever reason. It’s helpful to have additional activities like butcher paper and crayons available for them to doodle on. There are many free games kids can play which will keep them entertained. You will still need an adult or teenager around to keep them directed. Here are some free and low-cost ideas: Treasure Hunt – spray paint some rocks gold and hide them. Then all you have to do is draw a map. Keep-Up-The-Balloon, Musical Chairs, Freeze, Dance, Hokey Pokey, Water Balloon, Toss (outdoors only, obviously)Duck, Duck, Goose, Red Light, Green Light, Mother May I, Simon Says and many more. Have a place set aside for the presents. Then when everyone has arrived, move the presents to another area so they aren’t a distraction. Although it’s tradition to open presents when everyone is there, it’s better not to. It can be distracting for your child if they want to play with the present that they just opened. And it can be upsetting to a child if they brought the “wrong” gift. If you want to make other parents happy, let them know that they don’t have to match the present to the theme of the party. No matter how much you plan, something will happen. So here are some quick tips to help you cope with a smile: Prepare for when meltdowns happen…even with older children. The teenage helper can take the unhappy kid aside while the rest of the group continues on. Have lots of band-aids, ice, and tissues. If the parents are dropping off their child, ask if there are any food allergies or relevant medical conditions that you should know about. Also, make sure you have their contact information just in case something happens. Pirates/LuauBig/Trucks/Construction/Farming/Cooking/Cupcake Decorating/Olympics/Movies/Tea Party/Tie Dye & many more. There are countless themes available to pick one for your birthday party. Else you can make your own theme if you have something related in your mind. 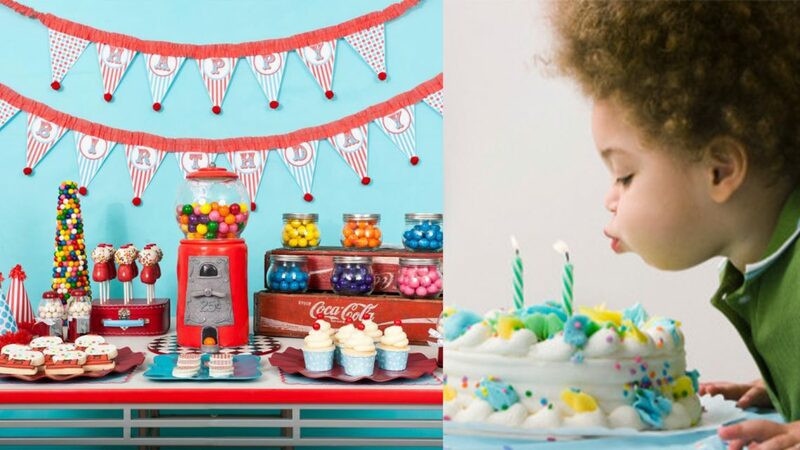 These birthday party ideas for kids are intended to help you plan the perfect party for your kiddo. While you will need to do some preparation and planning, your child’s birthday party shouldn’t be a hassle. The best birthday party ideas are the ones focused on age appropriate fun. If you have other children, you may want to give them the option to go hang out at someone else’s house. Or maybe they will enjoy hanging at the party. Just make sure they understand that they can’t change their minds mid-party as you will be too busy to take them anywhere. And find a safe place for your pets away from the children. Talk with your child beforehand and let them know that it’s not okay to sneak friends up to see the pets. Then get into the spirit of the theme and enjoy the party. These ideas are very amazing. You share the nice post to everyone. Thanks for your great work.